Whether you are a person who wants to learn how to play chess, a teacher who wants to instruct children how to play chess or an experienced player who wants to improve his/her game, this site has been written with you in mind! 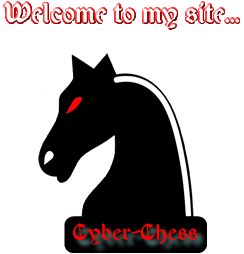 Constructed over the summer on 2012, Cyber-Chess is intended to be a quality instructional tool for those who wish to learn the game of Chess. The first stage has been constructed with absolute beginners in mind, but the site will be developed over the coming months to incorporate aspects that I hope will improve the game of more experienced players. The site is now online as the beginner's section contains all of the essential material needed by those who want to learn how to play. The other two sections are now being written and will be added over the coming months. The 'beginner's section' contains material that can be used by Primary and Secondary School Staff who have little or no knowledge or experience of the game themselves. The section constitutes a full chess course equipping those who follow it with the skills needed to play the game of chess to a good basic standard... with the added advantage that it requires very little financial outlay. There is a section for teachers, 'Chess in school', in the left hand menu bar that includes advice in setting up and running a chess club within a school. Down-loadable worksheets, 'Can-do' Certificates and other whiteboard assets are a feature of this site. There is even an introductory assembly! An initial selection of assets has been added. New additions will be advertised via the teaching resources site and notified on Twitter. Please let me know of any resources that could be added that would be useful to you, and I will see what I can do to help! Follow the site on Twitter, it is the easiest way for me to let you know when new elements are added to the site. DISCLAIMER: The information given in this site is presented in good faith, but the site-author is human and does make mistakes! Should you find anything that you believe is in error please notify the Webmaster of your finding. Any teacher using this site to set up a Chess Club needs to refer to their own School's Regulations on running a club within their establishment, and adhere to Health and Safety Provisions made therein. they should also carefully go through any competition rules for tournamnets they enter.